Trout Fishing Instruction at Dyffryn Springs. Casting a fly line is easy! Once you have learnt a few simple techniques, a fascinating and absorbing hobby will be open to you. Fly fishing requires little physical effort and is an ideal sport for men, women and children of all ages and abilities. Whether you are a complete novice or an experienced angler wishing to improve their technique, we can offer sympathetic tuition at very reasonable rates for individuals or groups. We can also provide all the tackle you need to get started. Our resident instructor, Mat Holloway, is a licensed Level 2 coach and holds full public liability insurance. 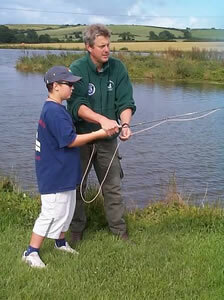 Mat can provide individual or group tuition and provide all the tackle you need to have a go. Children are very welcome, and for complete privacy we can offer access to Dyffryn Springs when it would normally be closed to the public.